The QBrand QBlog: Remind me again... who won MasterChef Australia? It's four months this week since the MasterChef Australia phenomenon reached its zenith. There's been much discussion about just why the show became such a hit: it's been called "an antidote for cynicism" and "a marker of the social, political and cultural times". Yeah, yeah, sure. But it's a commercial TV program on a commercial network, so it's also relevant to reflect from a marketing perspective on what has happened to the most prominent contestants, the judges, and the MasterChef franchise since the show's finale. And, frankly, much of it has been very disappointing. First, the franchise. With the next full MasterChef competition not scheduled to begin until 2010, Network Ten and producers FremantleMedia tried to sustain the extraordinary momentum by launching a Celebrity MasterChef spin-off immediately the main series finished in July. But with no episodes to screen before late September, they relied on the appeal of the judges to keep things sizzling with what (I gather) were supposed to be quirky teasers. This was a recipe for disaster. Calombaris, Preston and Mehigan may be able to whip up world-class dishes but they aren't comedic talent, especially not when given some of the most contrived and lame promo scripts imaginable. I don't think anyone could make a line like "more celebrities than you can poke a caramelised carrot stick at" sound funny. Still, it's not a good move to undermine the credibility and dignity of your judges and hosts by having them deliver bad lines. It's obvious that Celebrity MasterChef hasn't generated anything like the same buzz as the original. Is that a problem? Not in itself, no. It clearly doesn't have the same set of ingredients as the original. But, just as any poorly-performing brand extension can damage its parent brand, it would be a pity if a hastily-developed, underwhelming celebrity spin-off were to undermine the MasterChef brand. What about the contestants? Do you remember who actually won? Yes, it was "regular housewife and Mum" Julie Goodwin, who overcame her own self-esteem issues and tendency to self-destruct, or so the story went. I suggested in an interview with MX newspaper immediately after the final that, despite being beaten, Poh Ling Yeow was likely to achieve much greater media and marketing success than Julie. Hate to say "I told you so", but so far, Julie has secured endorsements for the very common-or-garden Fountain sauces in two ads described by a media analyst as "atrocious" and for Glad cling wrap and garbage bags, via another appallingly ill-conceived, unfunny and un-engaging ad. And check out the two kitchens! Both Fountain and Glad want us to believe that we are seeing Julie - a regular suburban Mum who happens to be a great cook - in her own kitchen. Clearly at least one of them is telling porkies! Is anyone advising Julie about which endorsements to take and how to maintain some authenticity about her image? Meanwhile, production begins this month on Poh's cooking show for the ABC and she has fronted a quirky and amusing campaign for cookware retailer Matchbox that seems to be a good match for her personality and appeal. Poh certainly continues to look like a winner to me. 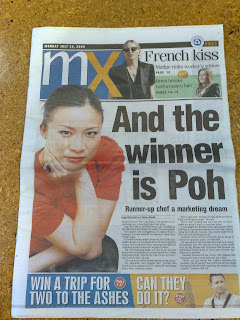 Poh was also one of the most highly publicised "chefs" appearing at the recent Sydney International Food Festival. And even though I thought it a bit of a stretch, certainly a much more credible path to be treading than what Julie is up to.